R.B. 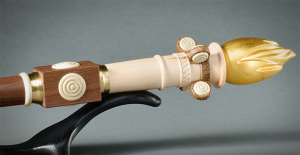 Annis Theatre, UIndy Health Pavilion, 1:30-2:30 p.m.
During the 2017 Commencement, President Manuel introduced a newly created ceremonial mace designed specifically for the University of Indianapolis by members of our faculty and leadership and fashioned by a local craftsman. Come learn about this symbol of scholarship and integrity dating back to the 11th century and its many features that remind us that universities are custodians both of the enduring traditions of learning and of the power they bestow upon those who come to learn.